The Friends for Conservation and Development are reporting that the illegal incursions by Guatemalans into the Chiquibul seem to be on the decline. But, the FCD says that they can't rest easy. That's because there is an emerging threat to the Chiquibul National Park - and its cattle ranches that monied Guatemalans have set up. Currently, these ranches slowly are encroaching on denuded parts of the Chiquibul, that were cleared by poor Guatemalan peasants who were using the forest for slash and burn farming. The FCD experts believe that if the problem is not arrested at its early stages, these illegal cattle ranches will grow, and become a bigger problem later down the road. "Two main things that really remains as key areas and issues of concern to us is cattle ranching, and then gold panning. That still remains also in Southern Chiquibul. The cattle ranching is certainly very different from the other issues that we had been presenting before, because cattle ranching, for one, is more organized. You are dealing with people that are better off. So, it's not really the poor farmers only surviving for subsistence. So, we are basically looking at more organized systems along the western border, in the Chiquibul area. And so, I think that really changes a little bit sort of the scenario. The area fly overs that we've been conducting more recently, and in fact, we started to report this cattle ranching about 2 years ago. What we have realized is that this thing is becoming more dominant all from the northern part From Vaca area, by Melchor De Mencos, and traveling way down south to the Colombia River Reserve, for example. So, we're looking at some 82-84 kilometers of that Western Border that are now practically being used a lot for cattle ranching." "When you say used you mean Belizean territory that should be untouched." "Exactly, so, we mean by cattle ranching activity now is occuring within the 1 kilometer of the western border, and even beyond that. So, we can look at 1.5 kilometers in some areas, nearly 2 kilometers within Belizean territory, and we're talking about cattle ranchers from Guatemala. 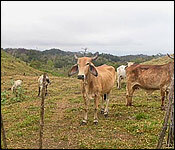 So, these are not Belizean cattle ranchers. So, the point here is that once they start no really to put in pastures, then, it can only increase more and more. As a result, part of our job is to inform, to be able to bring in the data, be able to inform the regulatory agencies that need to know about this, which includes the Ministry of Defense, the Ministry of Foreign Affairs, the Ministry of Forestry. So, we have done that. That basically already demonstrates, and it validates that we need now to really act very quickly to put in the interventions. Now, what are interventions that we are proposings. 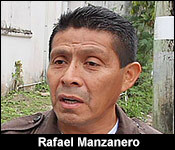 We need to get rid of that cattle, either we cut the fences, and let the cattle go into Guatemala. We have thought about informing the people up there, but who do you inform? Nobody is basically well identified that we can tell that these are the people involved. That is very difficult to understand and to be able to say. So the point is really to be much more bold." "So, you're saying just disrupt the activities." "Exactly, to disrupt it, and we should not leave it until it's up to 3-4 kilometers within Belizean territory, because if not, it's really going to be much more difficult. It's not dealing with the local poor farmers. You're dealing with people who are eventually going to want to put more strength to protect their "property". So, we need to act much more bold, and so, our outcry is we should not leave it until it really reaches to a point where we cannot contain it."